Cross-Country Bicycle Mission Tour highlights ministries to win lives for Christ! 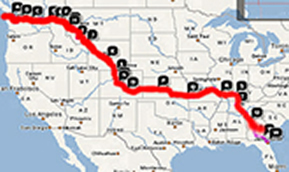 We completed a 52-day cross-country bicycle mission tour (from Neah bay WA to Amelia Island FL) on July 25, 2007. We began two months earlier with ministry fair events in Tampa on May 26 and in Port Angeles, WA on June 2, and set out to cycle across America on June 4. Please browse through our daily updates below, and feel free to contact us with your feedback.